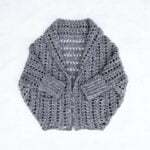 Beginner Draped Crochet Cardigan - Free, Easy Pattern +Tutorial! 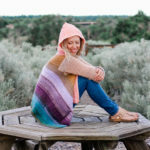 In Part 2 of the Remix draped crochet cardigan, we’ll continue using deconstructed yarn cakes to make the sleeves and pockets and then do some very simple finishing work to put it all together. 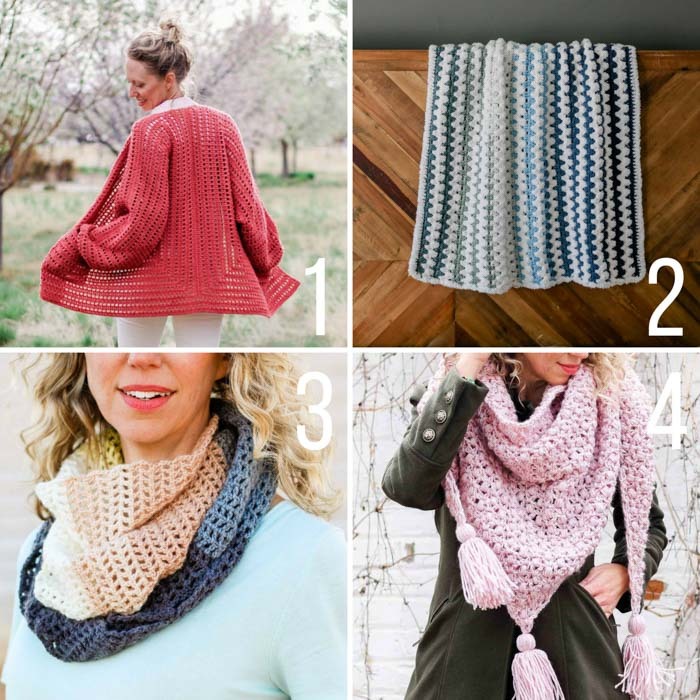 Scroll down for Part 2 of the free pattern or purchase the complete ad-free, printable PDF with color planning worksheet for $2.99 here. Find Part 1 here. 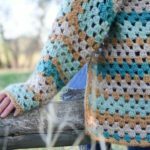 This free draped crochet cardigan pattern is part of a collaboration with my friends at Lion Brand Yarn. This post contains affiliate links. UPDATE:I put together a step-by-step video tutorial that covers how to choose your colors, deconstruct your yarn cakes and plan your gradient. Check it out here. 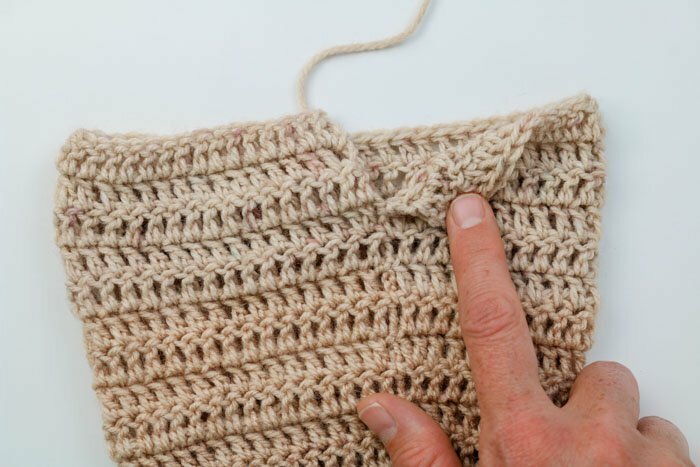 Since the body of our draped cardigan was made using back and forth rows of crochet in Part 1, we’re going to replicate that look by working rounds back and forth for the sleeves. Typically, rounds are worked just like that–in the round, in this case though, we’re still going to join each round, but then turn our work instead of continuing in the same direction. There’s a photo tutorial within the free pattern below to give you more details on how this works in case it’s your first time with the technique. 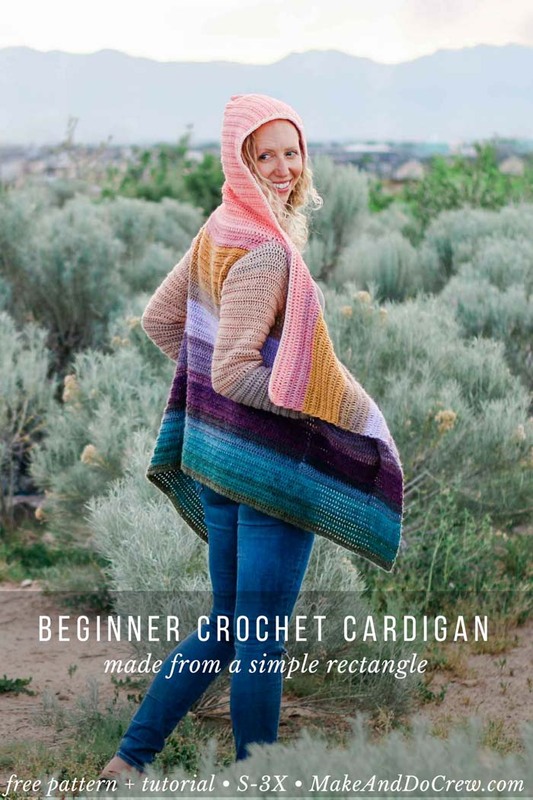 Since you’ve likely already planned your main sweater gradient at this point, you probably know which colors you’ll have left over. 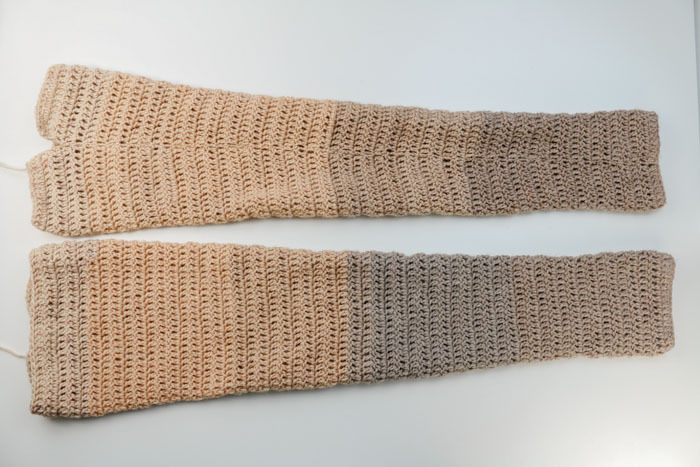 It can be helpful to consult the yarn amounts needed for the sleeves in the ad-free, printable PDF if you’d like to plan a specific gradient for the sleeves. It’s also important to remember to divide each color into two balls so you can be sure that the sleeves turn out similarly and you don’t run out of a color on the second sleeve. But Aren’t There a Ton of Ends to Weave In? Nope! 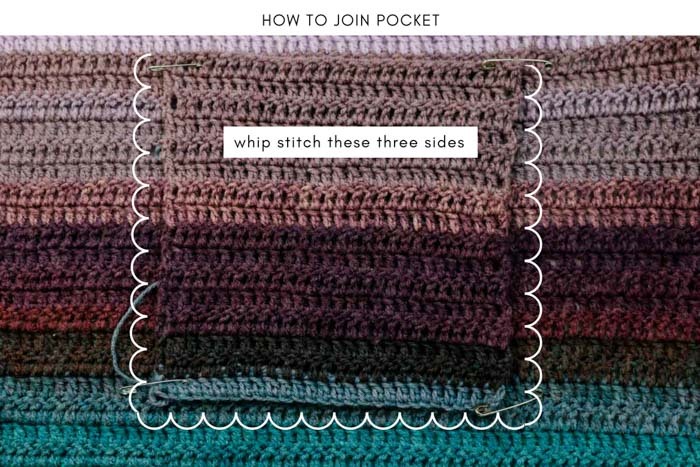 If you’ve been crocheting over your yarn tails as you go (seriously do this!! ), you will have only a handful of ends to weave in. I spent about 15 minutes doing my weaving chores at the end of making this. Pretty good for a project made entirely of stripes I’d say! 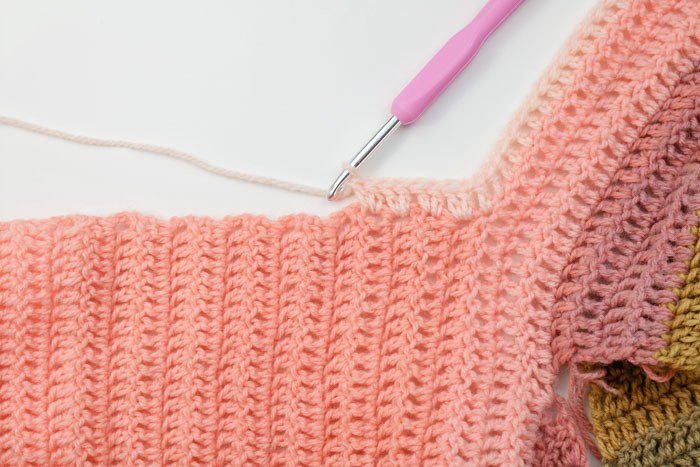 Alright, let’s finish this easy draped crochet cardigan up! Purchase Parts 1 & 2 of the pattern with color planning weight chart and worksheet for $2.99 here. Add this to your Ravelry favorites or queue here. Watch the video tutorial about planning gradients with yarn cakes here. Skills required included double crochet and working in the round. See schematic in printable PDF for additional measurements. When choosing size, consider armhole size as determining factor as main body of sweater is quite forgiving in its sizing. If in doubt, size up. Sample is a size small shown on a 5’9” model with a 36” bust. 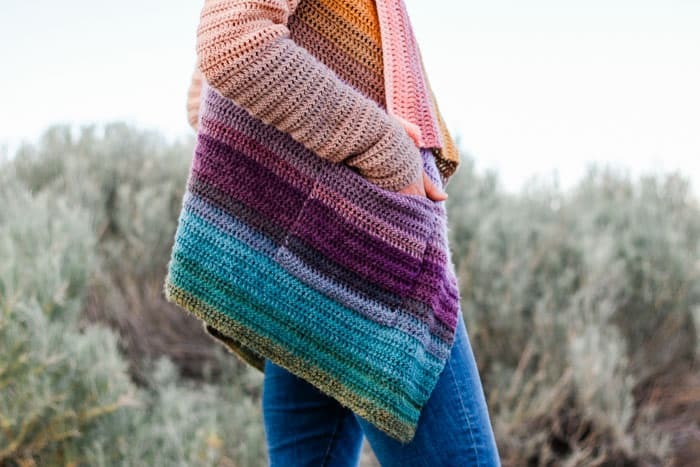 • Sample pictured was made by deconstructing skeins of Mandala yarn cakes and reorganizing the colors to create a gradient. Use the tutorial and color planning worksheet at the end of the printable PDF to roughly map out your gradient if desired. 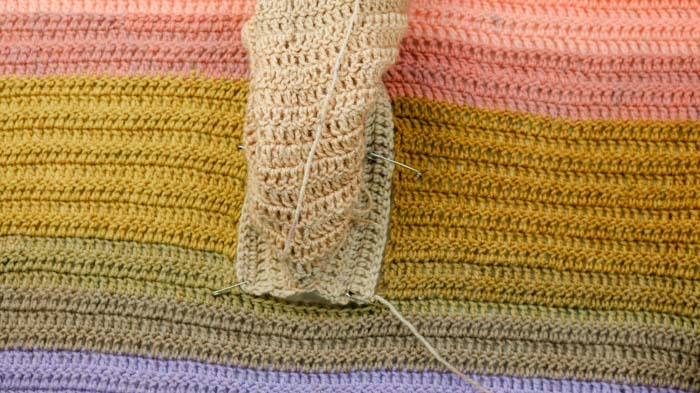 • If you choose to remix colors by deconstructing yarn cakes, a simple kitchen scale is a very helpful tool in allocating your stripes per color. Here is the inexpensive option I like. • Main sweater body and hood is worked in one piece. Sleeves are worked in the round separately and joined to body at end. • If working a gradient, complete all color changes at the end of a row as follows: work the final yo of the last dc of the row with the new color. • Crocheting over all yarn tails as you go will greatly reduce the number of ends left to weave in. By doing so, you should have only about 15 mins of weaving in when your project is complete. • Ch 3 at beginning of each row/round always counts as a dc. • Sleeves are intentionally extra long. 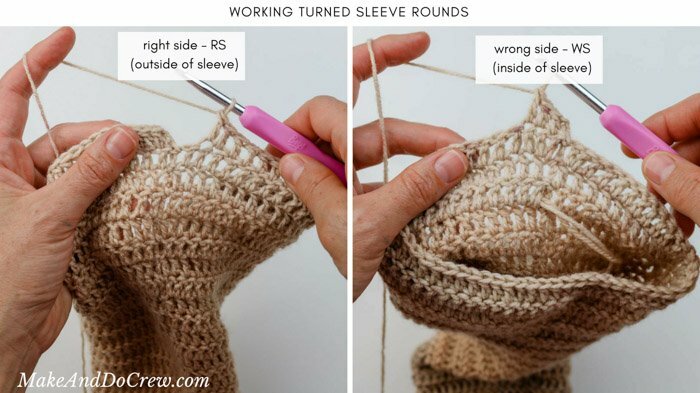 If you desire shorter or longer sleeves, make adjustments in the first section of the sleeve before increases [Rounds 1-11 (11, 11, 10, 9, 8)] by eliminating or adding rows. Round 2 (WS): Ch 3, dc in each dc to end, sl st to tch to join; turn. Rounds 3-11 (11, 11, 10, 9, 8): Ch 3, dc in each dc to end, sl st to tch to join; turn. Small: Rep an inc round every 5th round 3 more times for a total of 4 inc rounds. There should be total of 27 rounds at this point. Medium: Rep an inc round every 4th round 8 more times for a total of 9 inc rounds. There should be total of 44 rounds at this point. Large: Rep an inc round every 4th round 5 more times for a total of 6 inc rounds. There should be total of 32 rounds at this point. 1X: Rep an inc round every 3rd round 15 more times for a total of 16 inc rounds. There should be total of 56 rounds at this point. 2X: Rep an inc round every 3rd round 7 more times for a total of 8 inc rounds. There should be total of 31 rounds at this point. 3X: Rep an inc round every 2nd round 22 more times for a total of 23 inc rounds. There should be total of 53 rounds at this point. Small: Rep an inc round every 4th round 7 more times for a cumulative total of 11 inc rounds. There should be total of 55 rounds at this point. Medium: Rep an inc round every 3rd round 4 more times for a cumulative total of 13 inc rounds. There should be total of 56 rounds at this point. Large: Rep an inc round every 3rd round 8 more times for a cumulative total of 14 inc rounds. There should be total of 56 rounds at this point. 1X: No more increases necessary. 2X: Rep an inc round every 2nd round 12 more times for a cumulative total of 20 inc rounds. There should be total of 55 rounds at this point. 3X: No more increases necessary. The following rows are worked without joining. Rep Last Row 2(2, 3, 3, 5, 7) more times. Fasten off leaving a 24 (24, 30, 30, 36, 36)” tail. There should be a total of 58 (59, 60, 60, 61, 61) rounds + rows at this point. Fasten off leaving a 24-30” tail. Fold hood rectangle vertically so RS are together. (See photo above.) Using a tapestry needle and tail from fastening off, seam final hood row beginning at front (forehead) and working toward back (crown). 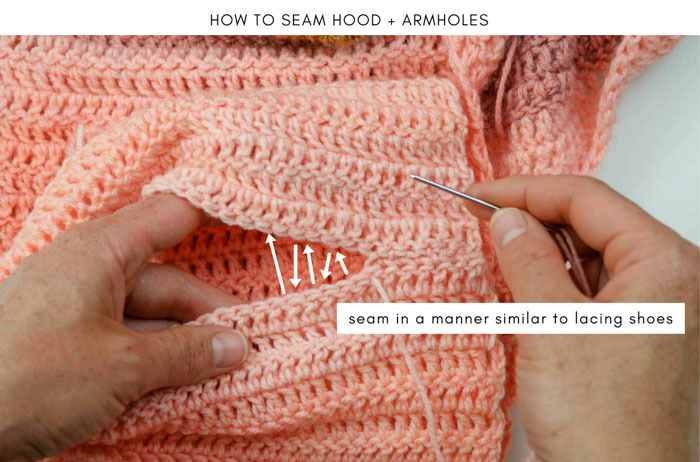 See photo below for preferred seaming technique. With RS of sweater and RS of sleeve facing, pin sleeve to sweater as shown in photo below. Slit at top of sleeve should be split and pinned to the bottom flat edge of armhole. Repeat with second armhole and sleeve. Seam using sleeve tail and same technique as with hood. Rows 3-16: Rep Row 2. Fasten off leaving 24” tail. Pin pockets to sweater fronts where desired. Take care to ensure RS/WS of rows are the same as in sweater front. Use tail from fastening off to whip stitch pockets in place. 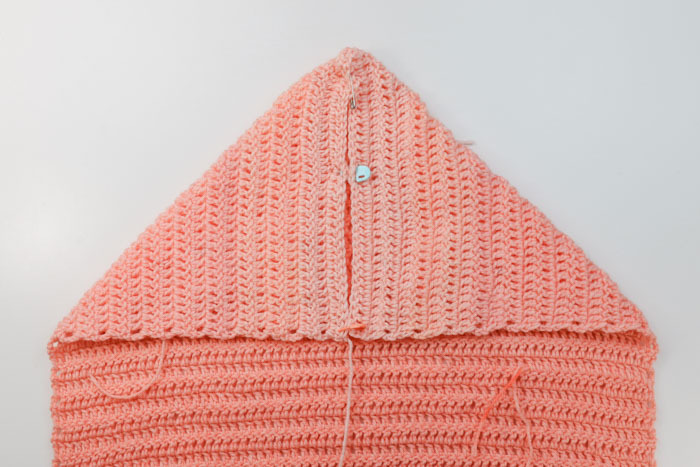 With WS of last collar row facing you and using same color yarn as final hood row, attach to sweater front upper right corner (left corner for lefties). Finishing Row 1: Ch 3, sk first dc, dc in each dc to hood, dc evenly up hood front by placing 2 dc per vertical row, down other side of hood front in same fashion and along second sweater front to opposite top corner. Fasten off. 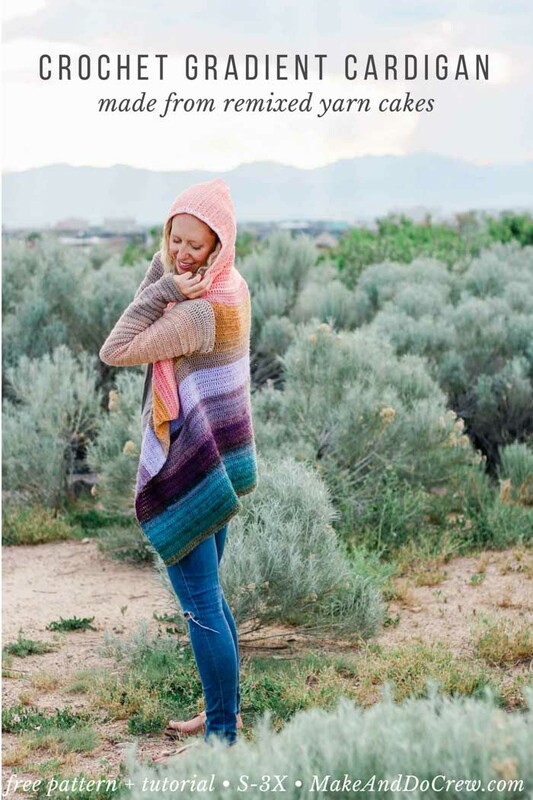 Weave in any remaining ends and throw this new cardigan on like the visionary crochet artist you are! Got Some Leftover Lion Brand Mandala Yarn? Here are some crochet patterns that would be perfect to use your leftover Mandala on! You can find all my free crochet patterns and tutorials here. You have so much verbiage in your posts I can’t even get to the patterns without printing 23 pages I like your designs but it boggles the mind the amount of talk makes me uninterested. Your patterns are lovely and easy to follow. I have been looking for something that fits a friends taste and I think this is it. And kelly cofield above, just copy and paste what you want to keep into a Google Doc or Word, whatever and you only have print those pages; or better yet, buy her PDF. Happy hooking!